Due to lower harvesting costs, there is an increasing trend towards the production of green asparagus. Today harvesting is done by seasonal workers, however the increasing labour costs and the lack of available labour supply forces farmers to optimize the harvesting process and to introduce harvesting aids. With automated harvesting the availability of labour force would play a less important role and make the harvesting much more flexible and cost efficient. While for the cultivation of green asparagus the degree of automation is quite high, automation of harvesting is still an unsolved challenge. 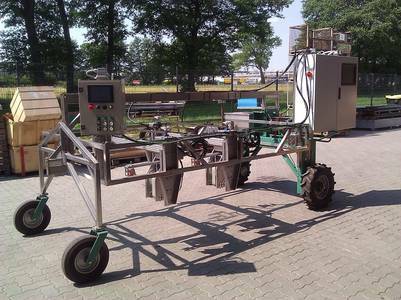 Several approaches for automated machines have been made, but none of the known automated harvester can guarantee a picking rate and quality like manual labour. This is mainly because of the difficulty and the complexity of the asparagus detection. GARotics will improve the automatic harvesting systems for green asparagus by enhancing the quality of the asparagus detection and by increasing the detection rate as well as the harvesting rate. Furthermore, GARotics will present a new gripping mechanism with three robotic arms. In addition, data are collected to support the yield forecast and panning of the next harvest run.